This adjusted EBITDA template will guide you through the calculation of adjusted EBITDA by removing any one-time items from EBITDA. Adjusted EBITDA is a financial metric that includes the removal of various of one-time, irregular and non-recurring items from EBITDAEBITDAEBITDA or Earnings Before Interest, Tax, Depreciation, Amortization is a company's profits before any of these net deductions are made. EBITDA focuses on the operating decisions of a business because it looks at the business’ profitability from core operations before the impact of capital structure. Formula, examples (Earnings Before Interest Taxes, DepreciationDepreciation ExpenseDepreciation expense is used to reduce the value of plant, property, and equipment to match its use, and wear and tear over time. Depreciation expense is used to better match the expense of a long-term asset to the revenue it generates., and Amortization). The purpose of adjusting EBITDA is to get a normalized number that is not distorted by irregular gains, losses, or other items. It is frequently used in valuationValuation MethodsWhen valuing a company as a going concern there are three main valuation methods used: DCF analysis, comparable companies, and precedent transactions. These methods of valuation are used in investment banking, equity research, private equity, corporate development, mergers & acquisitions, leveraged buyouts and finance by financial analysts, investment bankersWhat do Investment Bankers do?What do Investment Bankers do? Investment bankers can work 100 hours a week performing research, financial modeling & building presentations. Although it features some of the most coveted and financially rewarding positions in the banking industry, investment banking is also one of the most challenging and difficult career paths, Guide to IB, and other finance professionals. 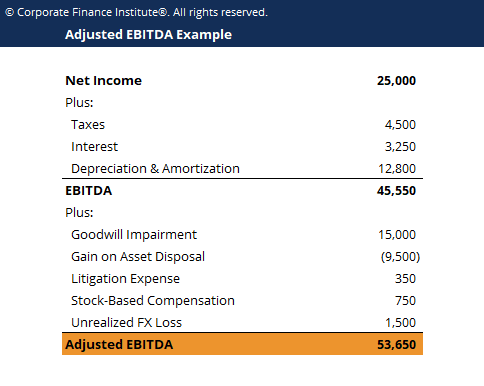 What’s Excluded in Adjusted EBITDA?